How To Stop LED Lights Glowing When Off? →How To Stop LED Lights Glowing When Off? After updating the lights of your home, offices or any other area – where you once used fluorescent lights – this idea overpowered you that there could be no complications regarding the new update. You were right but not to full extent. There are some reservations about the LED lights. The one main concern that will go your mind nuts over is why LED lights glow even if they are turned off. You turned off the power supply, but the glowing face of the lamp makes you think that there is some hidden mystery behind the scene. Well! Let me not kid you; there is nothing fishy about it besides some of the technical issues that are the cause for glowing LED lights. In this article, I would be telling you the reason, and of course, the solution as to how to stop these glowing lights. Why Do LED Lights Glow When Off? So before forwarding towards the solution, why don't just have a look over the causes that what makes LED lights glow even if the power supply is terminated. Generally, the main reason is the quality of the bulb. If by any accident or choice you opted for a low-quality LED bulb, this could be the reason that the bulb glows even after turned off. The other reason can be a problem within the switching system. If the neutral wire in the electric system is not appropriately earthed or due to the very high resistance in the wire, it can create some residual current. This current thus makes the LED glow even if the power system is off. Sometimes, due to electromagnetic induction caused by the remaining current in the cables can result in the glowing of the LED even if the powering is off. You might be wondering that why only LED lights glow due to the residual current. The reason is there are some diodes in LED lights which even with minimal amount of current can glow, unlike the other bulbs. There is one thing that is necessary to know; this glowing of the LED even if there is no electric supply provides no harm to the bulb let alone damaging it. But you ought to do something for it since it can cause a consumption of electricity no matter how little it is in quantity and thus resulting in higher bills. How To Stop The Glowing? So to avoid the above-stated problem, I will be telling you some of the solutions which will give you relief. You get pissed off since you don't know how to deal with it except to completely smash the bulb. Well! You don’t need to. 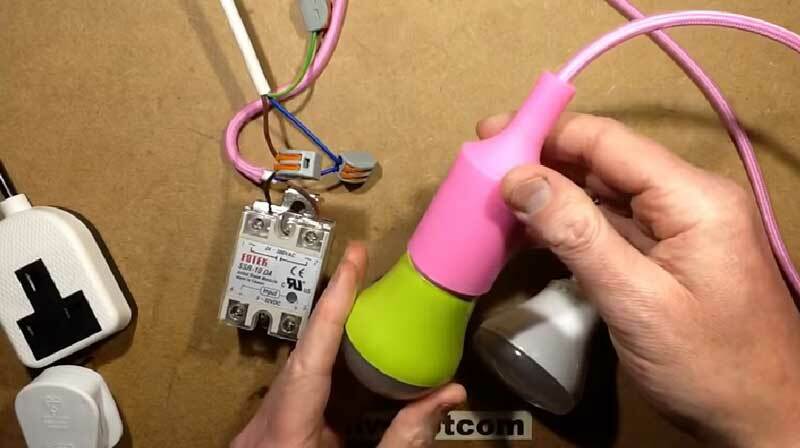 Sometimes, the problem can be with the LED bulb that you are using. You can replace the bulb with a better option, and most likely, the problem will be solved eventually. By now, you would have known the reason behind this mysterious glow. One of the reason can be your switching system as when the neutral wire is not earthed correctly. The first thing you ought to do is call an electrician and get your wiring checked. Once the wire is being appropriately earthed, you will witness the results. As most of the time, due to the electromagnetic induction caused by the residual voltage in the wires makes the after-glow. So to avoid this, all you need to do is install a Zener diode. The function of the Zener diode will be to block any amount of the residual voltage coming to the lamp, and hence the bulb will instantly be off once the power supply is terminated. Most of the time, the LED bulbs on a ceiling work through two-way connections. Here, normally what happens is that some of the conductors are far away from the switch. A voltage-carrying conductor might sometimes induce its voltage into the other conductors along the way. To avoid any such issue, you should install bypass capacitors in the ceiling lights which will thus minimize the coming voltage thus induced. If you have doubts about any residual current which will make the LED light glow even after the power supply is off, then get yourself a neon detector. This is one of the easiest devices that you can get your hands on. You will have to install the detector near the end of the fitting where there is the neutral earth wire etc. The neon indicator will glow up due to the residual unwanted current instead of the lamp, and hence it could be coped up with consequently. Whenever you change your bulbs, make sure you also update the dimmers. Generally, the old dimmers can function adequately for the halogen lamps, but they don't work accordingly with the specifications that the LED lights require. Since these dimmers need some minimum amount of current for their functioning and due to the economic nature of LED lights, they both never go hand in hand. Now if the flow is very low, the dimmer would be giving the output voltage even if the power supply is off. And they are hence causing the LED glow. It is therefore generally advised to replace the old dimmers with LED dimmers to avoid any kind of hassle. Once the dimmers are replaced, then there would be no issue of glowing LED lights even after the power is off. LED lights are no doubt one of the best and economical inventions. When compared to the fluorescent bulb, these not only provide you with the best results but also are friendly for the pocket. There are some of the issues as glowing even when the power supply is off. But you just got to know the solutions as for how to solve this problem. The problem can either be with the bulb used or the electrical supply. In either way, it's straightforward for us to replace the bulb or fix the wiring. How To Convert 4ft Fluorescent Light To LED? How To Dispose Of LED Light Bulbs Properly? How To Install LED Light Strips In The Car? DIY How To Make LED Tail Light? How Do I Install LED Light Bar On Roof? How Does an LED Light Bulb Work? DIY LED Grow Light: How to Build? How Long Do LED Lights Last and Why?